When young children hear a scary noise at night, they often run to their parents. The response is usually something like, “Don’t worry, it was just thunder.” Or, “It was just a noise, nothing to be frightened of.” Unfortunately for a dog that is afraid of noise, no amount of explaining or consoling will help. Noise Anxiety is a very common problem for dogs across the country. The estimates vary, but somewhere between 5 million and 15 million dogs suffer from noise anxiety severe enough for their owners to seek help. Below is a brief overview of canine noise anxiety including symptoms, causes, and remedies. If your dog suffers from noise anxiety, there are choices available to help relieve his or her stress. Make sure you do your research before settling on a plan. Noise anxiety can exhibit many symptoms and severity levels. On the less extreme end of the spectrum, a fear of thunder may just cause some shaking and clinging to her owner. On the other extreme, thunder may cause panicked running, destructive chewing, defecating indoors, or even jumping through a plate glass window! Some owners aren’t even aware that a negative behavior they are seeing is actually caused by noise anxiety. For example, does your dog get upset when you take photographs using a flash? That may be noise anxiety! The flash may remind your dog of lightning and she becomes frightened that a storm may be coming. Determining what caused your dog’s noise anxiety may be difficult to pinpoint, if not impossible. If you’re lucky, you may be able to trace the start of your dog’s anxiety to a traumatic incident such as being too close to a fireworks show or too close to a lightning strike and its subsequent thunder clap. But more than likely, it won’t be anything that obvious. Your dog may have a genetic predisposition for noise anxiety. Studies have shown that some breeds, such as Collies, Golden Retrievers, and German Shepherds, have a higher incidence of noise anxiety. 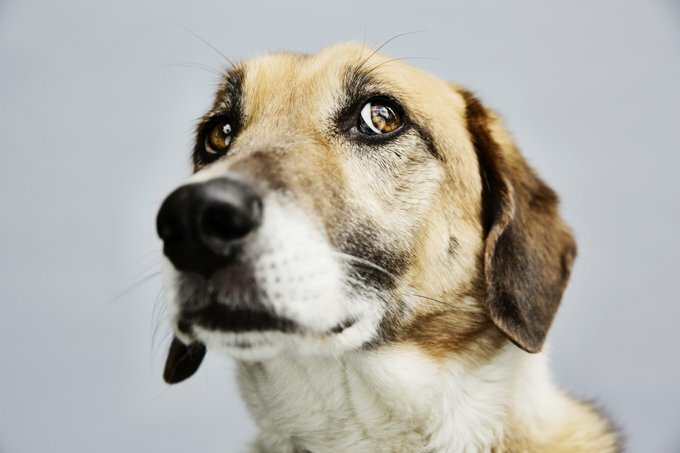 For some dogs, noise anxiety gradually appears and worsens as they age for no apparent reason. For other dogs, it appears as a puppy and stays with them. One thing that most experts agree on is that when it comes to noise anxiety, you don’t want to pet, coddle, or otherwise console the dog when she’s exhibiting symptoms. Your dog will most likely interpret your behavior as, “You see, I do have something to be worried about!” It’s important for the people around the dog to behave normally during events that trigger the dog’s anxiety. In fact, a possible cause for noise anxiety in the first place is her owner’s nervousness or fear of some kind of noise. Most dogs are very sensitive to their owners’ moods. If her owner has a fear of thunder, she may give her owner the benefit of the doubt! Different treatments work for different dogs. There is no guarantee that any one alternative is best for your dog. Besides the effectiveness at reducing symptoms, there are other issues to consider when evaluating which treatment may be best for your dog. Some treatments can be very time consuming for the owner. Some treatments can become very expensive and pose risks of side effects. It’s also not unusual for a combination of treatments to ultimately be the most effective for a particular dog. These are the “common sense” simple things to try, if feasible for your circumstances. Try creating a safe haven for your dog (such as a blanket-covered crate) or finding a location that will reduce the noise level. Try turning on music or the television to help mask the sound of the problem noise. If you know an event is coming (e.g. thunderstorm or fireworks), try giving your dog a lot of exercise beforehand. None of the above typically shows dramatic results, but they can help to reduce symptoms. This is a surprisingly simple and effective treatment for many dogs. A “pressure wrap” is anything that wraps around the dog’s torso and chest to provide a constant, gentle pressure. Why does it work? No one knows for sure, but it’s likely a combination of making the dog feel comforted and secure and distracting the dog from concentrating on whatever it fears. You can try to make one yourself out of an appropriately sized t-shirt, our purchase a Thundershirt. Pressure wraps often show good results with the first usage, however some dogs require two, three, or more usages before you see reduced or eliminated symptoms. Desensitization is the most common behavior modification tried for noise anxiety. In a nutshell, in a controlled environment, you begin by exposing your dog to a low level of the noise that bothers her. As she gets accustomed to it, you increase the levels louder and louder over time until she learns to tolerate the real deal. If you want to give it a try, several books are available on the subject. If your dog’s anxiety is serious enough, there are a variety of prescription medications that your veterinarian may suggest. Some are administered on a regular basis for the life of the dog. Some are given only at the time of an anxiety event. Sometimes a combination of drugs are used. If you go this route, make sure you ask your vet about any potential risks and side effects with the drug(s) you’re considering. Several products on the market have captured the properties of the natural pheromones a mother dog releases to calm and reassure her pups. You can talk to your vet about these products as well.